It had been kind of a gloomy weekend, with drizzle here and there, and adventure already…but when Sunday morning came around, I knew that I had to get Max in the car and go head out for some time on a trail in the woods someplace. 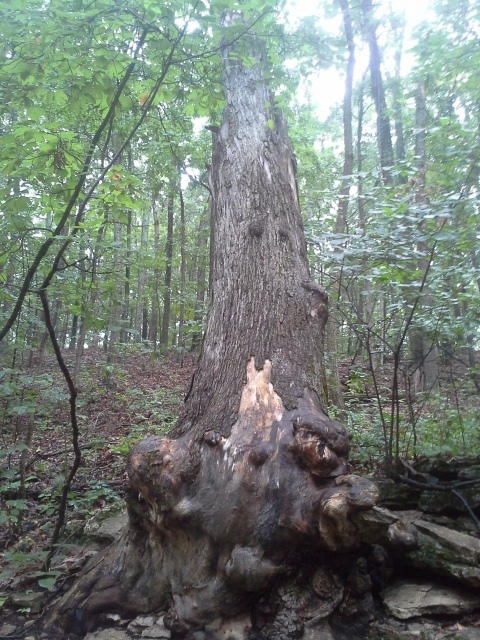 In the St. Louis County area, my favorite place to hike is undoubtedly Greensfelder Park. I have hiked there many times, and all the loops but one. 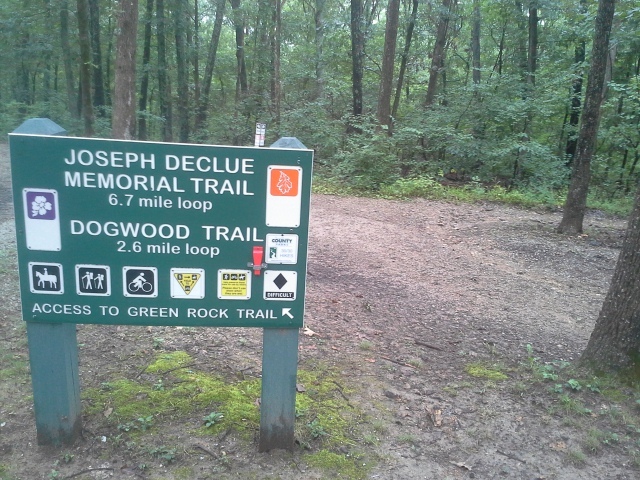 I knew that today I needed to conquer the 6.7 (NOW 8.2) mile Joseph Declue Memorial Trail. From the interchange of Interstate 44 and 270, take 44 west for about 14 miles, to exit 261 (Allenton Road/Six Flags). Make a right onto Allenton Road, and follow it past Six Flags and into Greensfelder Park. As you reach the top of the hill, there will be a long parking lot on the left side of the road, before you reach the visitors center which is a bit farther down Allenton. 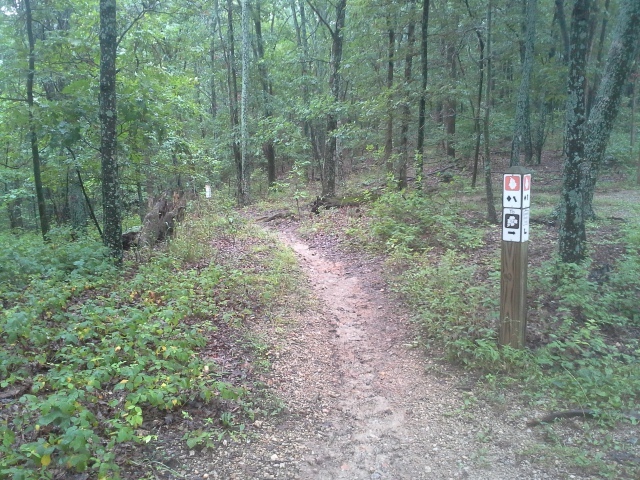 This is the trailhead to the Declue trail, as well as the Dogwood Trail and the spur that will take you to the Round House Memorial and access to the Round House Loop Trail. The trail starts out in the direction of the Round House Memorial, before branching off to the left and down a bit. It follows Allenton Road toward the direction of Interstate 44, and eventually crosses the road and heads into the woods behind Six Flags. It switches back and forth, slowly making its way up the hill to the ridge top, and then follows the southeast edge of the ridge before curving around the end and heading back in the opposite direction on the other side. 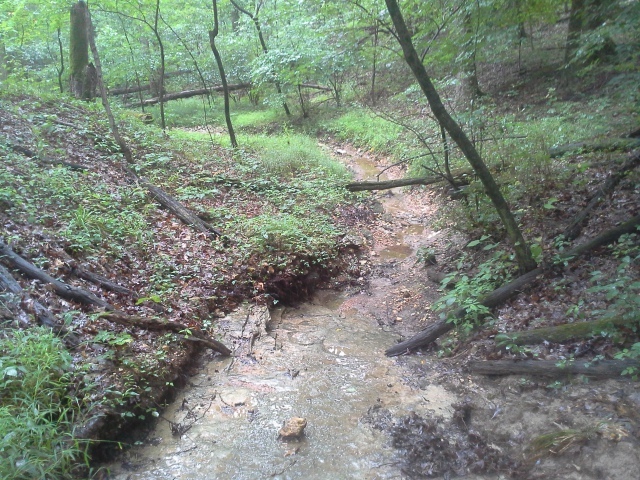 It then drops down into a deep, expansive ravine, finally crossing a small wet weather creek before climbing back up toward the center of the park. As it rises it starts to turn to parallel the park’s loop road, and then crosses the road and goes back into the woods. At this point you have an option. According to the older maps, once it crosses the road here, it hooks up with the Deer Run Trail and heads back out to Allenton Road (that is the route I took). However, (and the signs might confuse you) it has been changed recently to follow the Deer Run Trail down into Eagle Valley, and back up and out following the Eagle Valley Trail. This is the difference between 6.7 (turn left and follow the road) and 8.2 miles (head down into the valley). It is a good workout, and I am not ashamed to admit that after 6.7 miles, I was ready to be sitting on my couch watching some preseason football. 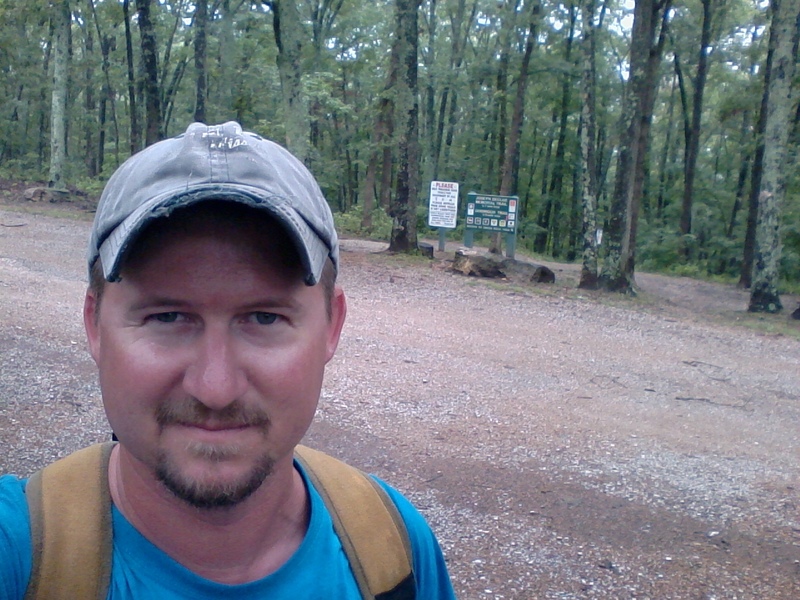 This is the longest loop trail in Greensfelder, and it should be hiked with ample water and a snack. 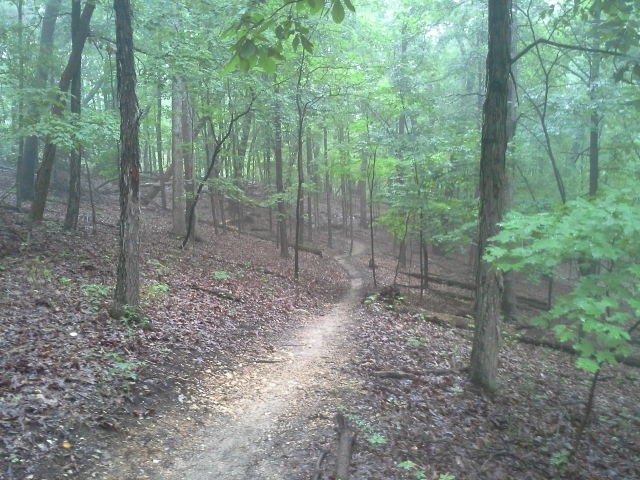 The trail itself, for the most part, was in very good condition. Other than the occasional muddy patch, it didn’t seem like it gets a lot of disruptive traffic, like the more popular trails in this park. Very pleasant path for a longer hike. At times it felt like we were in the deep woods. When you get to the backside of the ridge from Six Flags, the hill gets a lot taller feel than it did on the way up, and you get a sense that maybe you are hiking in a more mountainous area than you were at the beginning of the trail. I took it counter-clockwise, and be aware that once you cross the park loop road, it is now marked to go down into Eagle Valley and then back out, which adds an additional mile and a half to what some maps still in circulation will tell you. The map I had with me, that I had gotten THAT DAY over at the bathrooms by the campground, showed it following the Deer Run Trail back out to Allenton Road and to the parking lot (6.7 miles). Pay attention to this, as you might be end up hiking farther than you were planning if you follow the trail markers once you cross the park loop road (8.2 miles). There was something fascinatingly spooky about the screams of joy and terror that drifted up the hill from Six Flags. Take that into account if you would prefer a quieter hike, as the sounds will be with you for quite a while until you get to the other side of the hill and head down into the ravine. 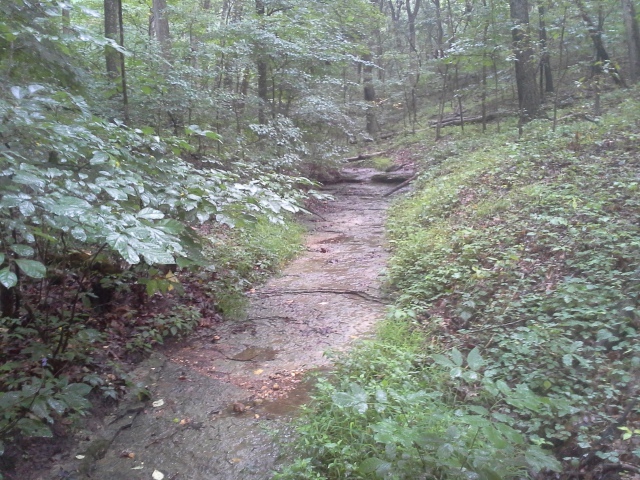 This is a rugged trail, and the length of it is notable, for the beginning hiker. 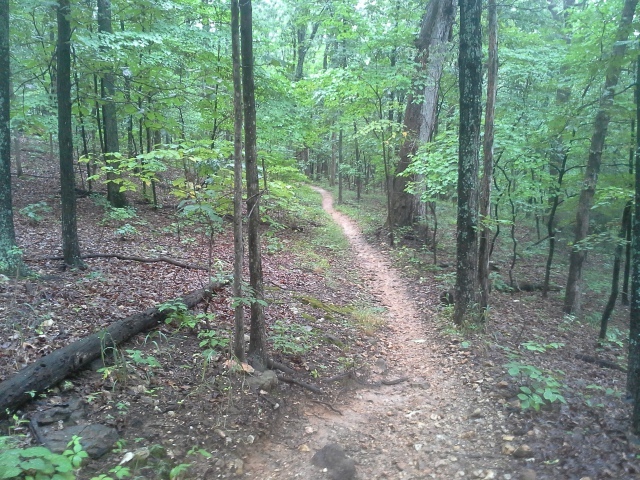 It is a lot of fun, but don’t make it your first trail to hike in Greensfelder. All in all it was a nice, healthy excursion for Max and I, pushing just a little farther and harder than we usually do on a Sunday afternoon trip through the forest. The sky was cloudy with sporadic drizzle here and there, and it was a fun hike on a relatively cool August day, exploring what seemed to me like the seldom traveled backcountry of a park that we were already so familiar with.